Summer is almost over but we already start dreaming of our next adventure! In order to plan and get most of it we like to share with you: Google Trips. Once more it’s all about user experience and how to give users or customers a unique experience. Everything you need at your fingertips. The app is available offline — simply tap the “Download” button under each trip to save it to your phone. 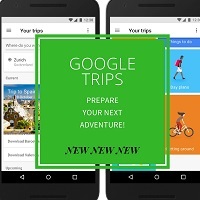 Google Trips – an iOS and Android app – uses a combination of data from Google Maps and crowdsourced contributions from other travelers. What is your location strategy to WOW your customers? More details over Google Trips you’ll find here.